Those who love good food will be saying farewell to a stellar staple of French cuisine here in California on July 1: Foie Gras. 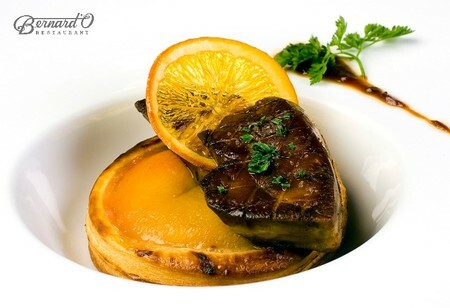 There is a ban on the duck and goose liver and we would like to notify those who appreciate the fowl that Bernard’O Restaurant in Rancho Bernardo is offering a five-course Foie Gras tasting menu on Thursday, June 28 at 6:30 p.m. The cost for the dinner is $75 (tax and gratuity not included) and can be paired with amazing wines if that’s your option, for an additional charge. Start the night off by indulging on the Foie Gras and Duck Confit Terrine with Golden Apple and Vanilla Chutney, housemade Fig Bread and a Pomegranate Reduction. A Grilled Maine Lobster Tail with Scallop and Foie Gras Ravioli, Braised Purple Kale and a Syrah Butter Sauce is your second course. There’s an intermezzo to cleanse the palate before the Beef Tenderloin Rossini Style with a Short Rib and Potato Napoleon, Garden Vegetables and Sauce Perigourdine are placed before you as the third and fourth courses. For dessert the Meyer Lemon Parfait with Lemon Sorbet and Raspberry Coulis caps off this sad au revoir for Foie Gras.